For those who plan a career in business, or already have launched a career with a bachelor’s degree, an MBA remains the gold standard for entering the upper reaches of your profession. But what are the advantages of having an MBA? For many ambitious business students, a bachelor’s degree is just a stopping place on their way to earning a graduate degree. For others, they have worked in their profession a few years and now want to elevate their career with an MBA and gain a competitive edge. In either case, the ultimate goal is the advantages an MBA can bring to your life and career. While many worry about the time commitment, the availability of quality online MBA programs has offered students a more flexible way to earn their degree. Consider the following advantages of having an MBA. Let’s get to the money issue straightaway. Yes, you can make more by earning an MBA. 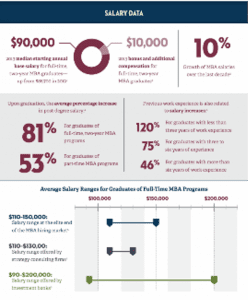 Recent data shows that there has been a 10 percent increase in MBA salaries. Full-time students see an increase of about 81 percent in their post-degree salaries, while part-time students see about a 53 percent increase. But earning an MBA is about more than money. Earning an MBA shows that you have committed to doing the work to become the best in your profession. It’s just as simple as that. When company executives look to bring new people into the ranks of leadership, they will turn to those who have earned a graduate degree. Whatever the case, the knowledge and skills that come with earning an MBA give you an advantage. The business world is always ever-evolving. Now, with technology disrupting many facets of business across all industries, knowing the latest business tools, techniques and strategies is more important than ever. Understanding best practices – and the reasons behind them – is of utmost importance in the modern business world. The knowledge gained with an MBA serves graduates well in every business. It’s possible to specialize in one area, but all MBA programs teach the type of leadership and cutting-edge business skills that will support their efforts in every industry. It’s also global, a critical issue with the expansion of many companies around the world. It’s easy to just ride the tide in your career. Many do so. But in a quality MBA program, professors will require you to push yourself into areas where you might not have 100% comfort. This is a good thing. Getting out of your comfort zone opens new possibilities and helps you understand what the possibilities are – something you might not have realized before you entered the program. An MBA remains the gold standard in business for good reason. The above are just some of the reasons it is worth the effort. For those who want to reach the pinnacle of success in their business, a master’s degree can open the door to many rewarding possibilities.